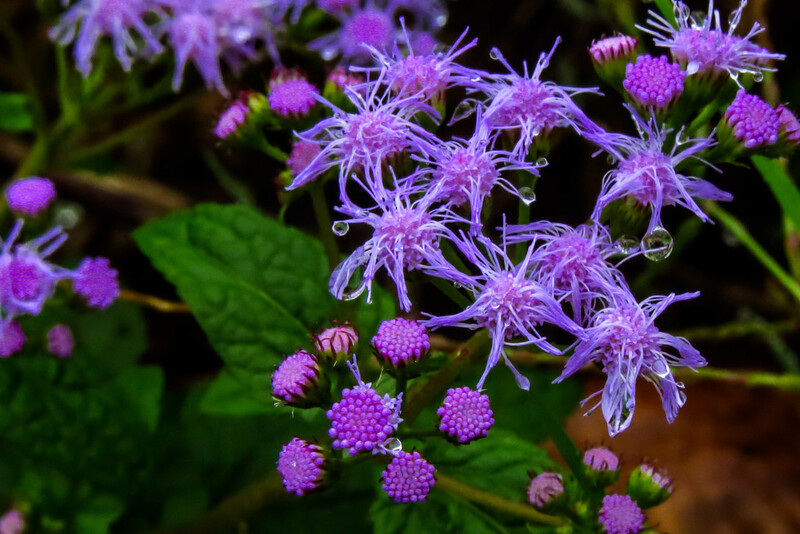 The ageratum is still blooming happily down on the creek bank - liked the little raindrops it continued to hold onto. Very dreamy and almost alien looking. The color contrast is great. What pretty flowers. The feathery ones seem to be dancing in the rain. The flowers look so healthy and fresh, and their gorgeous purple just glows! Love the big, circular drops of rain. They look like bubbles, and who can look at bubbles and not smile?! Wow -- the purple is SO rich. It's stunning! Great shot. There are some really large drops hanging on to the flowers. The purple really stands out on the dark green background. Love the colour. Fabulous shot. Good capture. Very striking colour. Flouroscent. Lovely colourful image Milanie and I love that big drop of water! Beautiful colour and detail, lovely capture. What a lovely flower, Interesting in both bud and bloom stages. Lovely capture with the raindrop between two blooms. Looks like it is heavy and needs the two to hold it up. What a beautiful splash of colour! gorgeous purple against the green, droplets are a special bonus. Wonderfully vibrant purples - I expect the flowers glow on an overcast day. I googled your ageratum - they're new to me - what beautiful plants! Beautiful shot of them, the droplets are the icing on the cake. BEAUTIFUL COLOR AND SHOT. FAV. Wow! Love the color and detail in this. Fav. I LOVE the one in the centre front that looks like it's suspended between two miniscule flower heads.